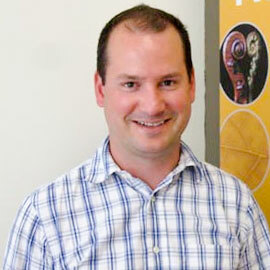 WATERLOO – Wilfrid Laurier University Assistant Professor Michael Suits has been awarded a 2015 Banting Discovery Award, one of only seven recipients chosen from applications from across Canada. Suits’ research seeks to understand how particular bacteria contribute to gum disease and cavities, making this research globally relevant. The prestigious Banting Discovery Awards program provides funding to the very best new investigators in all areas of medical research at a university or research institute in Canada. The intent is to provide seed funding to assist award winners in gathering pilot data to enhance the global competitiveness of their research programs. "We are delighted that Michael Suits received the Banting Discovery Award for his work," said Deborah MacLatchy, vice-president: academic and provost and acting vice-president: research. "This award will enhance his ability to do in-depth laboratory research, as well as contribute to the training of the next generation of researchers at Laurier." Suits received his PhD in biochemistry from Queen's University where his thesis work with Professor Zongchao Jia focused on heme processing and a lipopolysaccharide transport protein, LptA. He was a European Molecular Biology Organization Fellow at The York Structural Biology Laboratory at the University of York, UK with Professor Gideon Davies. Most recently, he has worked with Professor Alisdair Boraston, Associate Professor Martin Boulanger and Zymeworks Inc. at the University of Victoria. Students who are considering graduate work in this area are invited to contact professor Suits at msuits@wlu.ca. Read more about the Banting Discovery Award.